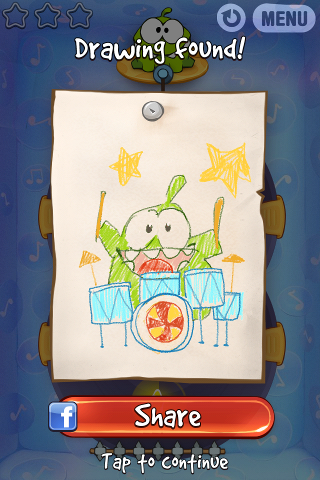 A new Om Nom Drawing (the 15th) has been added in "Cut The Rope" ver. 1.7 as shown above. It can be found in Level 11-16 as shown in the screenshot below. Just tap on the green circled region in this game level to get the drawing. Drawing Location in Level 11-16 of "Cut The Rope"
Hi buddy, I am henbeibi, one of your friends on Cut the Rope. Nice to know you have this blog, and I wish we can talk about the game here or by email. I'm thinking there could be some differences between iPhone 4 and iPhone 4S. "Purple Dream" and "Gregor Fran" used iPhone 4 previously, I don't know whether they've upgraded their devices yet. (Q1) Can you tell me which iOS device you used to play "Cut The Rope: Experiments" for all the 5 boxes, and also for the 11th box "DJ Box" in "Cut The Rope" ver. 1.7 ? (Q2) Did you turn on the "iCloud Sync" feature as this may "mix" your scores for the various iOS5 devices ? I don't have this problem currently as I only have 1 iOS5 device (iPhone 4S), the other iOS device I have is an old iPhone 3G which is not an iOS5 device (it can only install up to iOS 4.2.1). I'm thinking of retiring my old iPhone 3G as its gameplay is really sluggish for the "DJ Box". Every reset takes a few seconds and it's really annoying. I was about to play with it but both you and "vkdIPhone" in "Game Center" ("vkd1970" in "Crystal") kept on overtaking my score in the "DJ Box", so I kept on replaying the levels with my "iPhone 4S" recently. As mentioned in my article 'Score System in the "Cut The Rope" Games', "Cut The Rope: Experiments" has the "scrolling animation" bug in the game but when using iPhone 4S, I can only trigger the bug in 3 levels 2-11, 3-19 (can get 6,000 pts) and 5-7 (can get 6,000 pts). I'm thinking that "Purple Dream" (using iPhone 4) may be able to get 6,000 pts in a few more levels like 3-25, etc. Another reason is that I may have missed many strategies in those 5 boxes but I'm thinking there's some gameplay differences between iPhone 4 and iPhone 4S. If you don't mind, can you contribute your scores for 1 box, like the "Rocket Science" box in "Cut The Rope: Experiments" (just post your scores here) where you performed well and tell me which device you used ? For iPhone 4, there're also 2 versions, the older type and the newer white iPhone 4, so please specify clearly if you used iPhone 4. This is to help me figure out the differences among the various iOS devices, it's OK if you don't want to reveal your scores for the above. There was another top player who suggested that we exchange scores (only between the 2 of us) for a box but I rejected the suggestion as it would be unfair to others. It's good to keep the individual level scores in the boxes secret also because you would spoil part of the fun in playing the game if you reveal too much, so I'm only asking that you contribute the scores for the "Rocket Science" box in "CTR: Experiments", because you performed very well for that box. I don't want to know your individual level scores for the "DJ Box" currently. I may reveal my own scores for this box next time when I have time to write something on it. I am using iOS4.3 on iPhone4(the old one not the newer white iPhone) for all the Cut the rope games. Also, I am not using iCould. I spent much time on DJ Box, and it's becoming more and more difficult to get new points. If you want to know my scores just tell me. Here are the scores of the "Rocket Science" box. I got 6000 on level 25 in this box, also 3-19 and 5-7, but can not do it in levels 2-11. If you can get 6,000 pts for 3-19 in "CTR: Experiments", you should be able to get it for 2-11 also because 3-19 is more difficult. You have to add a bit of delay so that you can collect the 3rd star. There're at least 2 ways to do it. After cutting the 1st rope at EXACT end of scrolling animation to trigger the "scrolling animation" bug, you have to shoot either the topmost or middle gun and then cut away the rope a fraction of a second later so as to add a bit of delay, then shoot a second gun so that the candy can attach to the bottom bubble and rise up properly. From the fact that you can get 6,000 pts for 4-25, I think "Purple Dream" could get 6,000 pts for a few more levels like 3-25, etc. for "CTR: Experiments" also. When using iPhone 4S, I can only trigger the "scrolling animation" bug for the 3 levels as described earlier. Sorry, I can trigger the scroll animation bug in 2-11, but can not got 6000. My best score for 2-11 in "CTR:Experiments" for iPhone 4S is 5,560 pts. I typed too fast in my previous comment, it should be "If you can get 6,000 pts for 3-19 in "CTR: Experiments", you should be able to trigger the scrolling animation bug for 2-11 because getting 6,000 pts for 3-19 is much more difficult". My score of 2-11 CTR:Experiment is also 5,560.
and 3-19 is 5950 not 6000. It is really very difficult to get 6000. From what I know, Purple Dream can not get 6000 pts in 3-25 also. His best score is 5000, by giving up a star and triggering the animation bug. If you want to know, I can tell you his best score for other levels. Sorry, I mixed up 3-25 in CTR Experiment with another level. Purple Dream got 5000 in 3-25 without using animation bug. I think you have to seek Purple Dream's permission before revealing his/her scores. I know Purple in a game forum and he introduce me to play Cut the Rope and taught me much strategies. He is a good guy, but you are right, I should seek his permission beforing revealing his scores. (Q) Are you familiar with "Purple Dream" ? So he is a guy, right ? But in his forum, under the gender status he stated as female, so I had to assume he is female. I think the ropes in iPhone 4 may be slightly more "springy" than iPhone 4S, because when replaying the levels in "Cardboard Box" and "Holiday Box" with my iPhone 4S, although I can match most of the scores of iPhone 4, there're a few levels where I missed by 10 pts but I didn't try enough times, so I cannot confirm. There're a few more levels in "CTR: Experiments" where I think the "scrolling animation" bug should be able to be triggered but I couldn't do it with iPhone 4S. I only stated 3-25 as a possibility. For 3-19, I can get 6,000 pts. You have to send the candy very quickly to Om Nom before it starts to appear on the left. I spent a few hours to get it. In the "Rocket Science" box, for some levels I got the same scores as you but for some I got lower scores than you (could be due to the slight difference in game physics). Thank you very much for the great strategy, finally I got 5,680 on 4-24, but have no much time to replay other levels. How about your DJ Box? This DJ Box took me longer than expected to play because most of the levels require you to use "extreme" techniques if you want high scores. It's similar to the Foil Box, Cosmic Box (before they simplified some of the levels), Valentine Box, etc. You play very well in this box. It's very difficult for me to add points now but I'll try again when I have time. And I still haven't replayed with iPhone 3G yet. I tried a bit with iPhone 3G and noticed that the rope swinging techniques which I used for my iPhone 4S don't work properly in many levels, because the ropes are less "springy". I would have to modify the methods in some levels, it's really a headache. I didn't play Foil Box and Cosmic Box much time. I really like this DJ Box but feel slightly tired and need a break. Tell me when you think it's time to share our scores. I think many players have not started playing this box yet, and for those who've played, they haven't really maxed out their scores properly yet. So we should wait until more players have played this box then we reveal our scores. Otherwise some players may not like it. Maybe 2 or 3 weeks later. Meanwhile you can play other boxes or other games. Actually I am replaying Cardboard BOX because I have lost all my scores several months ago, but I found I can not get some high scores for following levels. Is it possible to get the top score on iPhone 4 ? Both "Purple Dream" and "Gregor Fran" have got the top score for "Cardboard Box" using iPhone 4. Check the "Crystal" leaderboard. Although the "Cardboard Box" is easy to get 3 stars, some levels are not so easy to get the best score, the toughest would be 1-13 (5210) and 1-18 (5800) I think for iPhone 4. Last time many of us spent lots of time playing the "Cardboard Box", so it's actually not so easy to achieve the top score. For iPhone 3G the toughest level is 1-13 (5250). I tried with iPhone 4S before and I could match all the iPhone 4 scores except a few like 1-13 and 1-18 where I missed 10 pts. But I didn't try hard enough. Your timing must be very exact in some of the levels to get the best score. For level 1-23, you have to "smooth out" the movement of the candy as much as possible and minimize the total distance travelled as well, this is a difficult level also. For level 1-24, I had to try very hard with my iPhone 4S to get the iPhone 4 best score also. It takes time to max out the scores. You may need to try hundreds of times for some levels. "Gregor Fran" removed his Crystal account I think, he got 141,700 as well (same as "Purple Dream") when I last checked. Check the Game Center instead. It's not so easy to get the top score. I reset my scores on my iPhone 4S (as described in my article) and I was lazy to play all over again. Very hot competition between us in DJ Box. I never thought I can get such a high score. I guess our scores should be very similar. For "Cut The Rope", the "scrolling animation" bug was removed ever since ver. 1.4, so for this "DJ Box" it seems like there's very little difference between iPhone 4 and iPhone 4S because for most of the levels, when we try to get the best scores, we skip the use of the devices provided like bubbles, anti-gravity devices, etc. and instead we use our own fingers to move the record handles very quickly to swing the candy about. But as I've mentioned earlier, the ropes in iPhone 4 seem to be slightly more "springy" than iPhone 4S, so for some levels iPhone 4 may be able to get 10 pts more. I have a few more levels which I think I can improve the scores by 10 or 20 pts more, so a few days later then I post my scores. ZeptoLab suddenly released a new box for "CTR:Experiments" so I think I don't have much time to replay the "DJ Box" of "Cut The Rope" now. The above scores were ALL obtained with ver. 1.7 of "Cut The Rope". Now there's a new ver. 1.7.1 and so far did you notice any changes to the gameplay, etc. in this new ver. ? I checked the iTunes description and it seems to be a very minor update. I haven't updated it to 1.7.1 yet. Thank you for your scores, and here is mine. with a 220 points short compared with yours, and a 250 points more than your scores. 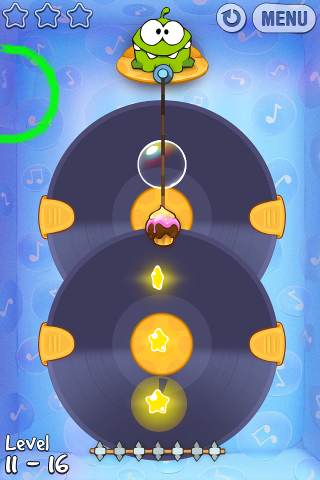 For level-07, you can use the bug by rotating the left-most DJ to right slightly and cut the rope very quickly. Sometimes, the candy will pass through the obstacle. 5920 should be easily to get I think. For level-13, it is very hard to explain so I hope you can understand what I said. Cut the rope and move the left DJ to slightly to left in order to avoid the candy to be connected the left hidden rope. Then break the bubble and rotate the right DJ very quickly to let the candy touch the right star and go up and down. At the same time, you should rotate the left DJ to its original position. Cut the right rope the candy will be connect to the left hidden rope and be capable to touch the bottom star. Switch (No rotate, I think you know what I mean) the left DJ from up to down so the candy will fly very quickly to mouth. This strategy is difficult but you can be the top if you success. I think I have to replay the "DJ Box" again before playing the new box of "CTR: Experiments". I never thought there would be so many difference also, although I know there are much extra points in some levels such as 4,15 and 19. I am not very good at the blowing equipment so level-19 could be a headache. I am playing "CTR Experiments" now, a very interesting box.